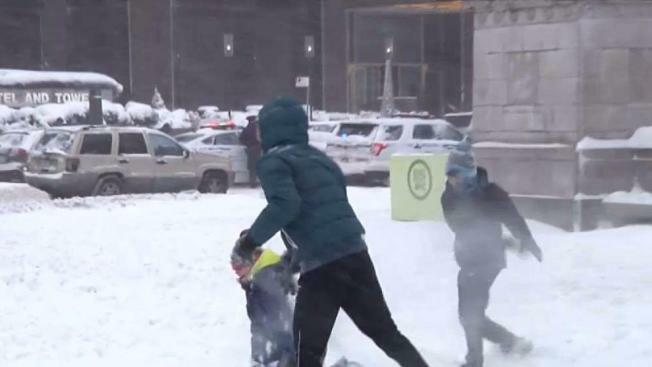 The white stuff didn't keep kids and kids at heart from enjoying Central Park. Erica Byfield reports. New York City public school kids better get those last toboggan rides in tonight. That's because the city Department of Education announced that classes would be in session on Friday after shutting down for the day Thursday as a blizzard dropped more than 10 inches of snow on parts of the five boroughs. "Tomorrow, Friday, January 5, @NYCSchools will be OPEN. Please take caution on your commute and dress warmly!" Mayor de Blasio said in a tweet. Field trips requiring yellow school buses will be canceled Friday, the DOE said. All other programs and activities will be held as scheduled, however. Students will be heading back to class on one of the coldest days of this arctic snap. Temperatures on Friday should struggle to get to the low teens in New York City, along with wind chills that make it feel much colder. Predictably, students weren't excited about the prospect of heading back to class after a day filled with snowball fights, sledding and snowman-making. "Aww, I hope we didn't have school, because I had to do this science thing," one Queens student huffed to a News 4 reporter Thursday evening. Others on social media also voiced their displeasure, crying out over the safety of sending children to school on a day with single-digit temperatures. Students at other districts were luckier, though: More than 100 other school systems in the tri-state announced delays and cancellations for Friday.